A large part of working in a creative, yet analytical industry like architecture is studying what works—and why. Buildings need to have form and function—many times they cannot only be a concrete box with just a utilitarian purpose. We’re constantly tasked with figuring out how we can meet our clients’ physical and aesthetic needs in their projects, and we’re always thrilled with tackling that challenge. We also love pulling inspiration from everyday life in our designs and filing away ideas for future use. As creators we appreciate high design—especially in some of the world’s most famous buildings. Three of us decided to share what buildings we wish we’d designed and why. Located in the Middle East in Baku, Azerbaijan, this cultural center houses an auditorium, exhibition hall and museum. This undulating, modern building is neo-futurist in look and was designed by famous architect Zaha Hadid, who also designed the London Olympics Aquatic Centre, China’s Guangzhou Opera House and the National Museum of Arts of the 21st Century in Rome. Although Nick hasn’t been to it, it still inspires him. The curvy building (that even looks like a shark from one side) is awe-inspiring. “The inside does reflect the curvilinear forms of the exterior where forms twist and wave with a feeling of motion. It also employs the clever use of thin interior lighting strips that curve around the forms as one integrated surface,” says Nick. This ain’t no ordinary apartment building. 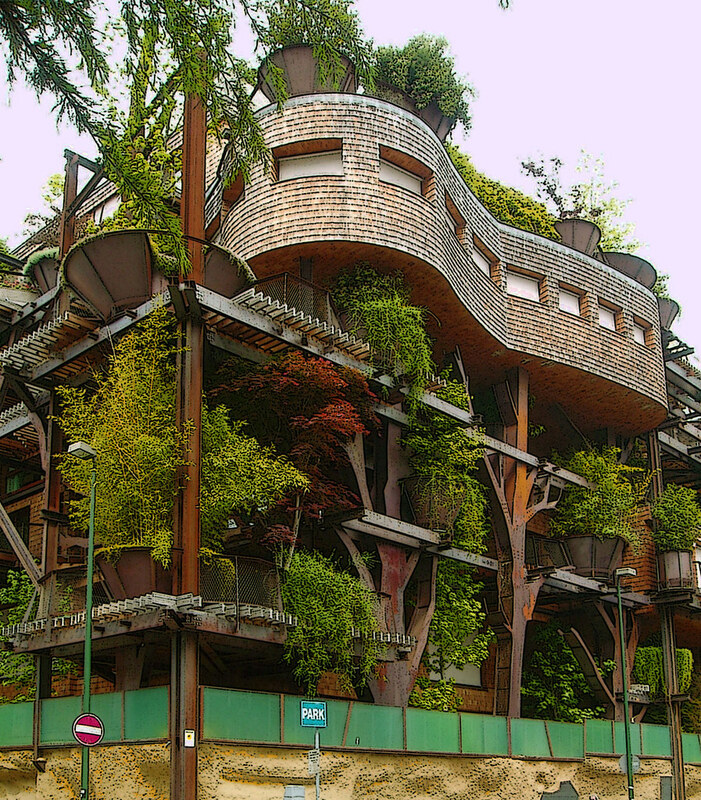 Turin’s 25 Verde is part treehouse, part postmodern architectural marvel. Designed by architect Luciano Pia, the building employs steel beams and curvy lines and also weaves in the natural world with 150 trees planted on its terraces and another 50 planted in its courtyard. The roof is even covered with gardens. The legendary Palais Garnier was designed and built in the mid-1800s by Charles Garnier for the Paris opera. The Baroque design (bordering on Rococo) with a mix of Art Nouveau was very opulent and controversial at the time for its garish decorations, especially during a time when the modernist movement was just beginning. “What I really like about this building is not so much the decorative forms, but how Garnier understood the true purpose of the building architype that went well beyond creating an opera theater,” says Kirk. The building has three main parts to it, the backstage, the theater and the grand foyer. It’s in the grand foyer that the brilliance of the building is understood. Blending classical stylings with extravagant decoration is the hallmark of Baroque/Rococo architecture. But Garnier lived in a modern time and many of the forms on the interior of the building start to take the shape of Art Nouveau architecture (especially in the staircase’s designs). Outside of the architectural style, the planning of the grand foyer is the masterpiece of this building. Kirk feels that Palais Garnier is not only a stunning example of art meeting architecture, but the building stands for a higher purpose. He hasn’t seen it in person himself yet—but it’s on his must-see list. “This to me is what architecture is truly about—it’s created to serve the function of humans. And if it’s done correctly to enhance our lives, sometimes it serves those functions in ways we don’t even know. Garnier could have easily placed a simple ticket counter in the foyer and spent the time and money on the theater. From a practical sense it would have worked just as well. But from a pure human sense … it would have been a failure in comparison with what he designed,” says Kirk.